How can we help you achieve optimal health and wellness? Resilient Health's services span full spectrum family medicine and integrative medicine. Below, we’ve highlighted a few of the health states that we see most often. We realize you may have concerns that do not fit this list. We encourage you to reach out to us to discuss your needs. The integration of evidence-based complementary and alternative medicine with evidence-based conventional medicine. Full spectrum family medicine focuses on the whole person, from treating symptoms to identifying the underlying cause of disease. 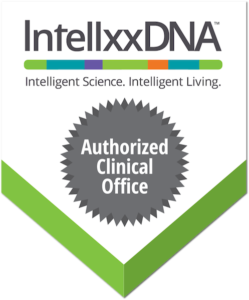 We offer comprehensive genomic counseling, powered by the IntellxxDNA.™ We analyze the potential risks and benefits that lie within your DNA, and create a focused prevention and intervention plan. We help decrease the risk of Alzheimer's and have cutting-edge, evidence-based protocols that can reverse mild to moderate cognitive impairment. Carol Bilich, MA, LMT provides a variety of different therapeutic modalities to facilitate healing of the mind, body and spirit. Not all fatigue stems from a lack of sleep or thyroid issues. We specialize in helping you regain healthy energy. Cholesterol, diabetes, high blood pressure and heart disease make up the bulk of "chronic disease" found in Americans. We help patients optimze intervention strategies. Balanced hormones can be an essential for good health and disease prevention as we age. The non-thermal laser (cold) penetrates deep into your tissue promoting “photobiomodulation”. For over ten years, Dr. Hausman-Cohen has specialized in treating osteoporosis. She is on of Austin's top physicians who help patients navigate improved outcomes. We utilize our knowledge of integrative medicine along with nutrition and genomics (optional) to create personalized treatment and prevention nutrition plans. Ask us about advanced medical genomic consulting to help you achieve optimal health. Insight into your gene function, and the ability to create an individualized health plan in response, offers the most targeted, personalized route to achieving your health goals. If you've already done a 23andMe test, that is great. We can use your data within the IntellxxDNA™ analytic tool, and provide more depth of information. Haven't done a 23andMe test? No problem. You can take a saliva test right in our office. The ultimate self care is better health care. Whether you want to take a pro-active and preventive approach to your health, or you need more dedicated care for your ongoing or chronic issues, a Resilient Health Membership can provide you with the individualized and integrative care you need.